This AC adapter from Brando is pretty nifty. 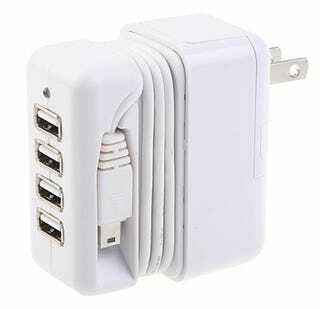 Not only can it power five USB devices, the adapter can also be used worldwide. With internal voltage regulation (100-240V) and a number of travel plug adapters, the $22 "AC to 5-USB Power Adapter" should keep your USB devices fully charged through the US, Europe and Asia. It also looks a lot like a MacBook charger, which you may or may not love.